This widget creates a navigation menu with dropdowns. It’s designed for bigger sites with pages organized into categories. 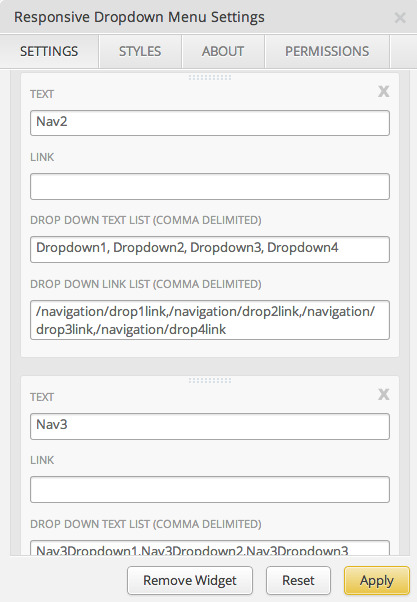 This widget is also responsive, so unlike most dropdowns, these will work on mobile devices. Products. Link to right to categories and collections of products. Blog posts. Add links to categorized blog posts. So users don’t have to search your whole blog, but can easily find a link to the post they’re looking for. Documentation or knowledge base articles. If you have a complicated product, you probably have complicated support documentation. Let users narrow down their search by clicking through the menu.